Can Tho (VNA) - Six APEC member economies are displaying agricultural products and advanced agri-production technologies required to address food security and sustainably develop agriculture at an exhibition that opened in Can Tho city on August 21. Besides Vietnam, the other economies joining the exhibition are Japan, Australia, the US, China and Taiwan. Speaking at the event, Vietnamese Deputy Minister of Agriculture and Rural Development Le Quoc Doanh said the exhibition showcases technologies for sustainably increasing agricultural productivity and incomes, adapt to climate change and reduce emissions of greenhouse gases. It also focuses on the relationship between food security and climate change, sustainable natural resources management, sustainable rural–urban development, facilitation of investment in agriculture and food, and harmonisation of food safety standards and food-loss control, he said. 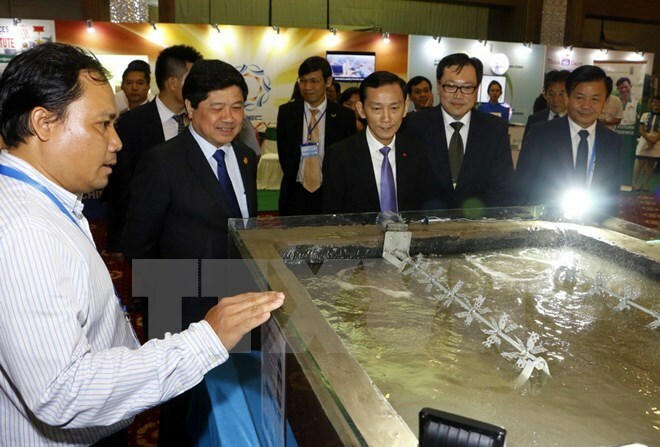 Vietnam has set up 8 of the 18 booths at the event to exhibit drought- and salinity-resistant rice and other crop strains besides other agricultural products from the Mekong Delta. Dao Anh Dung, Vice Chairman of the Can Tho city People’s Committee, said the exhibition is an opportunity for APEC economies to discuss and seek solutions for sustainable agricultural development. Koichi Yamada, a visitor from Japan, praised the quality of the organic products and model shrimp farms initiated by Can Tho University in the delta. Nancy Sun, an exhibitor from China, said that 95 companies worldwide had purchased her soy food products, which are being shown in Vietnam for the first time. “I hope to expand business and seek partners in Vietnam and further collaborate with other economies as well,” she said. The city’s agricultural sector has implemented many programmes to help farmers adapt to climate change and apply technical solutions to improve productivity and quality, thus increasing their incomes, Dung said. Many technological solutions and production models have been rolled out to improve the adaptability of rice to the impacts of climate change, he said. It has expanded the area under aquaculture that has adopted of GlobalGAP, ASC, BMP, and VietGAP standards, he added. Can Tho city has nearly 88,000 hectares under rice, 11,000ha under aquaculture and 16,000ha under fruits.